Ohio's weather is unpredictable. All of us who live here know it's possible to experience all types of weather within a single day. It's not uncommon to start the day off wearing shorts but need your winter coat by evening. We recently had a couple days just like that...we went from temperatures in the 70's one day to 40's the next! I (Amber) don't even pay attention to weather predictions (looking out my window in the morning and checking the outside temp on our thermostat is good enough for me, and if anything serious is coming, I'll hear about it from someone else). The exception to this is when we're approaching a photo session...then I am watching those predictions like a hawk! 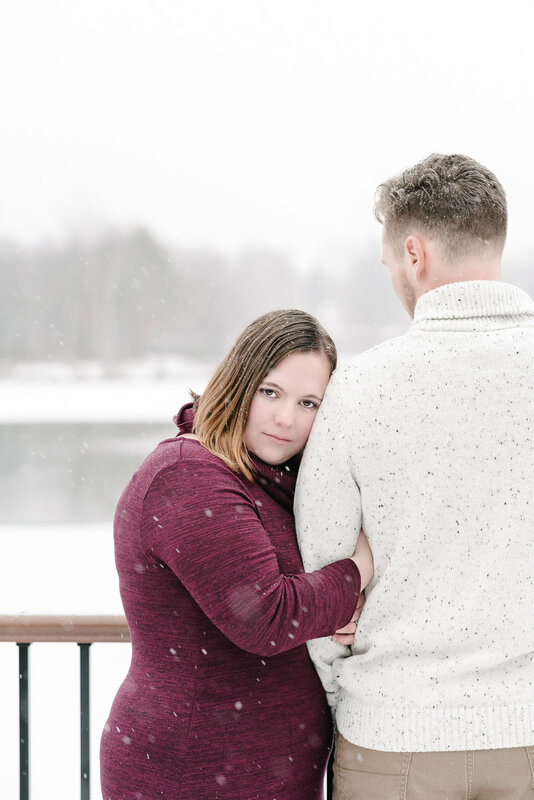 We were especially vigilant in watching the weather predictions for Emily & Tyler's engagement session because Emily really wanted snow! And you would think that here in Ohio, where we regularly get piles of the stuff throughout winter, that getting snowy portraits for them would be a piece of cake. Um, not so much...we haven't had much snow at all this year compared to the norm. So when we finally got enough to cover the ground, it was game on! Bret and I thought everything was going great as we drove to our first location...that is until we were about 2 miles out and realized there was less and less snow on the ground the closer we got. At this point, we had to keep the date so Emily & Tyler would have their images in time to get their Save-the-Date cards sent out when they planned. My heart sank the closer and closer we came because I knew this was something our Bride really wanted. But as we started the session (with barely a bit of beautiful white in site), something amazing happened...it started SNOWING!! It started snowing and just kept going! Eventually, the snow was settling on their hair and coming down heavily enough to be visible in their portraits, and it all looked so beautiful! By the time we reached our second location, the lake there was covered in white and it was such a romantic sight. And while it was quite cold, our couple didn't bat an eye (except to get the snow off their lashes), and were up for anything! We all had such a fun time!! I truly think it was extra special because we didn't expect things to be so perfect...and because it worked out the way it did, it felt magical! In case you’re a football fan (like Emily & Tyler) and are thinking ‘there’s no #2 for the Browns’…you’re right! We did a little Photoshop magic for them so their jerseys made the date of their wedding. They’re using this image for their Save The Date cards! So cute! !